The Angerstein Railway Act, 1851.
of future Railways authorized or to be authorized by any the present or succeeding, Sessions of Parliament, and/or other acts in relation to Railways; and Two other Acts were passed in the Ninth and Tenth Years of the Reign of Her said Majesty, and An Act for regulating the Gauge of Railways, and An Act concerning Commissioners of Railways. Be it enacted, That what this Act contained shall be held to exempt the said railway from the Provisions of such several Acts respectively, but provisions shall be in force in respect to the said Railway so far same are applicable thereto that nothing herein contained shall be deemed or construed Provision to exempt the said Railway from the Provisions of any General Act in future to Railways now in force or which may hereafter pass during this or any future Session of Parliament. Acts. That no Works shall be done under the Powers of this Act For Protection which shall in any way interfere with any Sewers, Drains, or Water works under the Control of the Metropolitan Commissioners of Sewers or which shall otherwise injure or interfere with any Watercourses or other Matters under the Control of the said Commissioners enacted therewith; and nothing in this Act contained shall be deemed or construed to extend to prejudice, diminish, take away any of the rights, Powers, or Authorities vested Commissioners, but all the Rights, Powers, and Authorities in them shall be as good, valid, and effectual as if this Act been passed. That in this Act the Expressions “the Railway” or the interpretation shall mean the said Railway from the River Thames to the North Kent Railway. That in citing or referring to this Act in other acts of short Title or in Pleadings, legal Instruments, or other legal Provisions, it shall be sufficient to use the Expression “The Angerstein Act, 1871”. Printers to the Queen’s most Excellent Majesty. 1851. Extract from John Smith, A History of Charlton Vol. 2. In October 1852, the South Eastern Co. were leased Mr John Angerstein’s one-mile long branch line that had been tentatively started some three years earlier, and finally completed in May 1851. The private railway joined the North Kent line near Charlton to Angersteins wharf on the Thames at Bugsby’s Reach. As it was built almost entirely on Angerstein’s own land and with his own money, it did not require the usual Parliamentary powers, although he did find it necessary to go to Parliament for authority to build the bridge across the Greenwich and Woolwich Turnpike – now the Woolwich Road. Much of the earth to construct the embankment leading up to the bridge and across the marshlands came from the Blackheath Tunnel excavation. The line cut Coomb Farm in two and Mr K.R. Roberts a descendant of the family who farmed there for almost a century wrote in the Greenwith and Lewisham. Ant. Soc. Trans. No. 4 p. 186’…that the farm buildings were in Westcoombe Hill facing the flight of steps over the Angerstein siding. The steps were erected by the railway company for the benefit of the farm workers to save having to go round under the bridge in Woolwich Road. They were very useful for another purpose as one could climb to the top of them with a telescope and see what all the farmworkers were doing …’ The South Eastern Co. had ambitious plans for an extension of the line to Blackwall Point where it would run to a floating pier extending 120 ft. into the river. The aim was to establish a ferry across the river so as to form a communication with the newly opened North London Railway. The Admiralty objected on the grounds ‘that such protrusion into the Thames would deflect the current and also inconvenience craft navigating the river’. They did however suggest that a dock or recess in the land cut out to receive the floating jetty would equally serve the purpose. Presumably the S.E.R. had second thoughts, possibly financial, for they rapidly dropped the river project. Just before the turn of the century (October 1898) the company purchased the railway and wharf with its 755 ft. frontage from the Angerstein Trustees, following the death of William Angerstein grand- son of John Julius the builder of the Angerstein empire. A series of short branches – or long sidings – were subsequently added to serve local manufacturing companies – United Glass Bottles Co, G.A. Harvey Co., Christies Ltd, and the L.C.C. Tramways Central Repair Depot, while the line itself was extended by the South Eastern Gas Co. to their oil and coal wharf near Blackwall Point. In 1912, William Christie & Co. Ltd (later Christie & Veney Ltd) large timber importers and creosoters purchased the 16 acre siding site from the S.E. and C. Railway. They improved the wharfage front to accommodate vessels of 5000 tons, and for fifty years 150-200,000 tons of iron, steel timber, coke, sand, slates, tiles, fullers earth etc was discharged annually. Today, the line is still thriving, although not on such a scale as previously. Most of the sidings have been removed but Thames Metals still have rail served premises and Murphy Aggregates employ 100- ton hopper wagons to carry sea-dredged aggregates to their London depots. As part of the Southern Railway’s electrification project, Angerstein’s Wharf Branch was electrified in 1959, largely on the overhead system. The line was never designed for passenger traffic, although on rare occasions special trains for railway enthusiasts have been run. This article dates from 1998 at a time when the Dome was still being planned – and some transport enthusiasts were lobbying for the Angerstein Line to be used for access by the public. Local people and transport buffs have been trying to persuade the millennium exhibition organisers that the best way to get visitors into the site would be via the heavy rail link which still goes part way there. The Angerstein railway has never been for passenger traffic and is hardly known outside Greenwich and railway enthusiast circles. An appeal for someone who has studied the line has gone unanswered. I am nevertheless aware that for me to try and write a history of a railway line is probably near suicidal. ‘Angerstein’ is a name, which keeps cropping up in the East Greenwich area. It originates with the romantic figure of John Julius Angerstein – a Russian financier with mysterious, possibly, illustrious origins. He may well have been the son of the Empress Ann of Russia and a British banker. He spent a long working life in the City of London, regularised Lloyds of London and leaving his pictures to the nation, thus founding the national gallery. In 1774 he had bought land in Blackheath and built the house which is now Woodlands, once Greenwich’s Local History Library. Angerstein had numerous connections within the City of London and political circles. Greenwich Marsh was a small item in their enormous world of influence. However, Angerstein, is one of the group of influential people who can be said to have shaped the marsh and its industries. His country home was built to overlook the area of the marsh itself. Angerstein first acquired the area, which roughly covers today’s Westcombe Park. Part of Westcombe Park road may have been his carriage drive. He, and his family, went on to acquire, by 1856, the whole stretch of land between the river and the Dover Road. Combe Farm covered much of the lower part of this area with its farmhouse on the site of the new houses slightly north of Westcombe Park Station. John Julius had one son, John, born in 1773 who lived much of the time in Greenwich. He had a large family – the most important members in the context of this story are a younger John Julius (born 1801) and William (born 1812. John Julius himself died in 1823. In 1850 John Angerstein must have seen this stretch of land between Blackheath and the river as full of potential. The North Kent railway line was being built through a tunnel, which ran from Blackheath to a point adjacent to his land. On the other side of the river the new Victoria Dock would have an entrance almost opposite. All that would be needed was a wharf and a connecting railway and good business would be guaranteed. The railway was planned in 1851 to run on Angerstein’s land from the North Kent Railway as it emerges from the tunnel into a chalk pit. The Angerstein line would then go to a riverside wharf. Built on private land there was no need for an act of Parliament except for the bridge needed to cross the Lower Turnpike Road between Greenwich and Woolwich. This Act was applied for a passed in May 1851. The line opened in 1852 but had already been leased to the southeastern railway for operation. It has been said that the spoil removed from the Blackheath/Charlton railway tunnel was used to build the embankment on which the railway goes on its way to the river. It runs parallel with Lombard Wall – the Tudor flood defence and property marker. It has been said that it was originally intended that the railway should be connected by ferry to Blackwall and perhaps also to Greenwich pier. It would thus effect the elusive connection out of Greenwich, which was prevented by the Park and the Royal observatory. Despite these hopes the line was, and has remained, entirely a goods line. As industry grew in East Greenwich and Charlton so the line grew and was extended. In the 1890s the line was extended right across the peninsula to enter the gas works via a bridge across Riverway. A connection was made with lines from the LCC tram depot built alongside the line in Woolwich Road and at some stage connections were made with other local factories. Branches from the main Angerstein Line seem to have gone into Harvey’s and the United Bottle works to the east in Charlton. Angerstein Wharf itself is shown on successive maps with up to fourteen branches fanning out to the riverside. An article of 1925 gave the tonnage handled as £58,000 in 1859 rising to tenfold that in the 1920s. The wharf then handled ‘manure, steel rails, fertiliser, coal, coke, stone, sand, flour, slates and timber. By 1951 however it was said that the 755-foot river frontage with an upper dock ‘too small’ for ‘present day craft’ was mainly taking petroleum spirit and oil – together with Fullers Earth from Redhill, … timber flour, manure, iron and steel, waste paper. Anyone who wants to see it close up is advised to go to the down side of Westcombe Park Station. There they will see a bridge arching out across the 102M motorway. Walk across this bridge and you will find yourself on a little pathway, which crosses the line to disappear into a passage between the houses to emerge in Fairthorn Road. It is is a scene from then 1920s, at the latest. Just south of the foot crossing the line has left the main North Kent line in then old chalk pit. A siding also goes south into the derelict Angerstein works – alongside which recently a young girl’s body lay for many weeks. The railway continues south to cross the Woolwich Road – is this still the original bridge from the 1850s? and goes alongside what was locally known as the ‘Airfix’ works but was in fact the LCC Tram Depot. 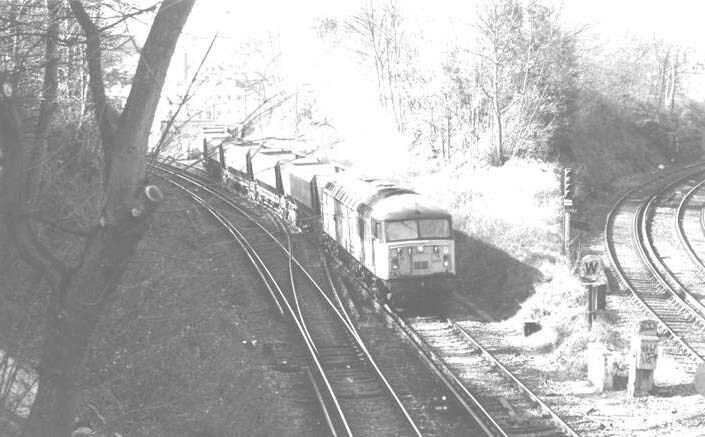 From the railway embankment you could see a turntable and lines down in the works – are they still there? In the 1980s two massive bridges were built to take the line across the newly built Bugsby’s Way and the link into the gas work was cut with the opening of the river end of Horn Lane. Most of the line into the gasworks remained. It continued from Horn Lane to near the site of the new Jubilee Line station on an embankment. This embankment has been destroyed in early 1998 by contractors working on the Millennium Exhibition site. The bridge across Riverway, removed in the 1980s, was rebuilt in order to get lorries into the Dome site but has now been removed together with its 1890s abutments. By any standards the Angerstein railway was a big success. Very few purpose built goods lines are still at work today, so unchanged. It has the potential to bring thousands to the Millennium Dome by rail from anywhere in the country – and, the world via Eurostar. More importantly to locals it could link the Jubilee line to British Rail and transform public transport in south London. John Angerstein was more of a visionary than he knew! From c.1912 to post 1955 part of the wharf was leased to William Christie, with, among other things, a plant to treat timber with creosote. Some of the earliest references to land in the Marsh refer to ‘Thistlecroft’ and it may that this is the area referred to.. In 1555 the riverside area is named as ‘Abbots Howkes’. However the land was in Westcombe Manor, in a sub area known as Nethercombe, which stretched as far as the areas now known as Blackheath Standard. The land had been part of that passed in AD 918 by Princess Aelfrida to the Abbey of Ghent and then nationalised by Henry VIII in 1537, and then annexed to the Royal Manor of Old Court, East Greenwich, and briefly owned by Anne Boleyn. Various other tenants and lessees occupied the area, including the Tudor historian William Lambarde, until in 1801 it was passed to John Julius Angerstein, the Russian born founder of Lloyds. 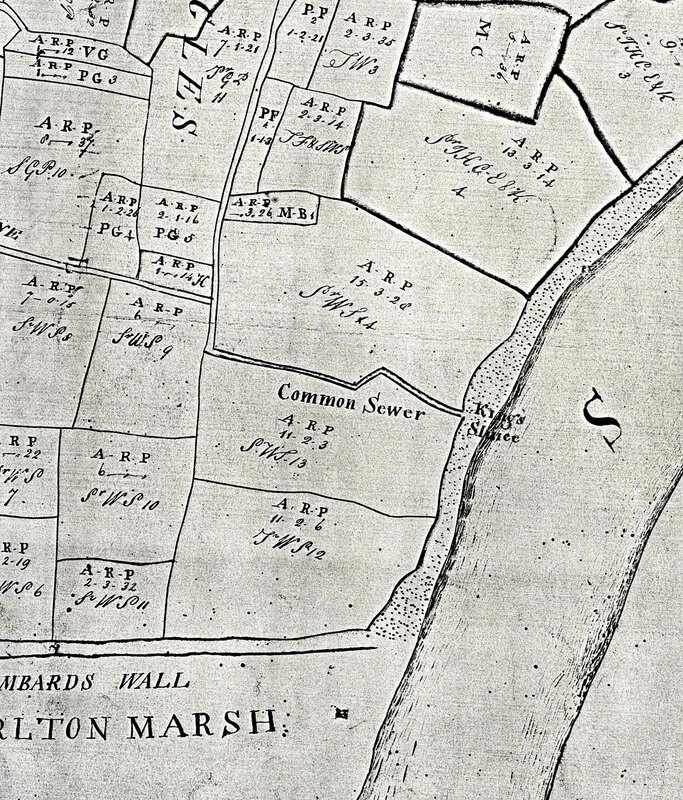 When the Skinner Plan was drawn up in 1746 the two plots between Lombard Wall and Horn Lane are marked as owned by Sir William Sanderson in the occupation of Thomas Moor. Moor was the lessee of Combe Farm (the farm was between Combedale Road and Woolwich Road). A century later the Tithe Map shows most of the area not let but under the control of John Angerstein – and he was later to construct a private railway line through the fields. This railway remains in use, although it has never carried passenger traffic.